Geeky is probably not a term most people who know me would instantly describe me as. I’m not a tec head at all, I don’t play video games, have a penchant for the strategies of chess or even own an iPad. 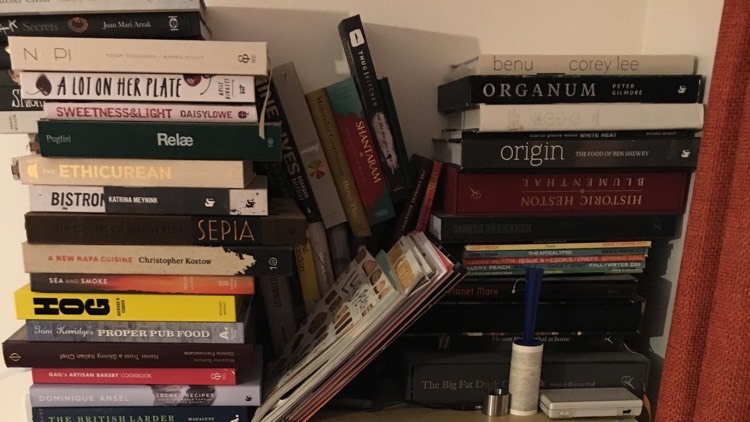 Yes I wear glasses and I’m a little OCD about how things are organised and set up in my life but mainly in the kitchen and I’m pretty sure that’s just a chef thing, so I won’t accept much criticism of that. On the other hand, I am a complete loser when it comes to my job. I spend pretty much all of my free time sharpening knives, buying new ones and comparing stones to sharpen them on. I am constantly pinching spoons from everywhere in search of the perfect rocher (all chefs do this)! I research handmade aprons and knife rolls and love to find anything I can cook in cast iron. I enjoy collecting different hot sauces, fermenting and pickling pretty much anything my sausage like fingers can pick up! I could go on for days, but let me assure you, I’m pretty sad. The one thing I am most proud of however, is my cook book collection. I have spent the last 20 years collecting them and I don’t even know how many I have. They are split between my Mum’s house, my place, our head office and the ones I have loaned out to some of our chefs, that I can’t even remember who has what. I couldn’t put a monetary value on these, wouldn’t even guess, but all I know is, it’s a lot! I don’t travel as much as I would like and all the money in the world would never allow me to travel the world eating at all the different restaurants. That in itself would be a full time job. If anyone can tell me how ‘Elizabeth on food’ can do it, then I’m all ears. So this means I have to study from a distance. Much like an astronomer who is unbelievably passionate about the stars, galaxy and the working of the universe but will never get to stand on the edge of a black hole or do a roly poly down an asteroid. I ‘YouTube’ things, read every interview they have given, buy the book and read, read, read! No word of a lie, I have been known to take new books on the train with me to read on the commute into town. I, like the others I have the pleasure of working with; have a never ending passion for knowledge. Mine has a fierce competitive edge to it, I can’t stand the thought someone else will know something I don’t. That is ridiculous, I know, but I can’t help it! You have to be ahead or you are behind and I’m not having that! I owe it to every chef in bartlett mitchell and Inn or Out Events to be the one who knows the answers to their questions, ‘food wise’, that is, because in most other parts of life I don’t have a clue! The collection will continue to grow and I will no doubt become more and more of a dork as time goes on, but I don’t care. So when you see that bearded fella with bloodshot eyes, cuts and burns on his hands, reading some cook book from some chef you have never heard of, from some part of the world you have never been, come and say hello and I will bore the pants off you about lacto-fermentation, the kitchen layout of Grace in Chicago or ‘Making a Murderer’ on Netflix.